Honda's supercar is now faster and meaner, with a 3.2-litre engine and six-speed gearbox. 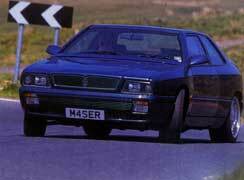 Maserati Ghibli Cup, the drama of the Esprit V8 or the character of its nemesis, the 911? The big motorbikes outnumber the mobile homes and caravans, so we know we're on the right road. The snails are here for the dramatic scenery while the bikers, like us, are here for the snaking tarmac that clings to its contours, dipping and cresting, running and tucking. There's room enough for everyone to get along, and our convoy is pressing on as inconspicuously as it can, which isn't very. The arrival of any one of these cars at the summit café would swivel most heads from the views, so all five crunching into the gravel car park is the equivalent of a Rio carnival. In some countries, mob scenes would ensue and, after lifting engine covers, being quizzed and allowing a few to 'try it for size', we'd be left with more fingerprints that Scotland Yard. But this is England, the northern tip of the Pennines to be precise, and just a few approach to ask the odd question about the car that truly intrigues them. 'So what's that then?' Despite having been on sale here for six and a half years the Honda NSX might as well be freshly minted, never-before-seen exotica. With a bigger boot it'd make a great bank robber's car. And not even Honda-spotter will have seen it in this colour before. Honda calls it Imola orange – we reckon Lucozade is more descriptive – and it's a new hue heralding the NSX's first major revisions: the 3.0-litre V6 VTEC is replaced by a lustier 3.2-litre, and the old five-speed 'box has become a six-speeder. These revisions give the NSX the clout and cogs to match its bête noire, the Porsche 911. At 276 bhp (up a mere two ponies on the old motor) the Honda's engine is still a few horsepower down on the 285bhp Porsche, but in a zero to 100mph drag race the NSX gets there in 12.2 secs, a clear second ahead. Reality check: that's 10secs quicker than any of the hot hatches we tested last month. However, if on-paper performance was all that mattered, we wouldn't have driven all this way to find these glorious roads. 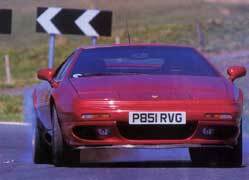 The V8-engined Lotus Esprit blitzes them both, hitting 100 in 10.5 secs. Storming, but a 'standard' TVR Cerbera makes 100 in single figures, and this aquamarine blue example is even quicker; it's the prototype '4.5' which means a 4.5-litre version of TVR's home-grown 4.2 AJP V8 and an extra 50bhp, making 400bhp in total. Sub-eight seconds to 100 is the target. Gulp. All of which makes the most inconspicuous of our group appear just a bit limp. The maserati Ghibli Cup is upright and conservative in this company, and is out-gunned on straight-line times, yet it had little trouble holding its own on the run up here. It is effortlessly rapid, thanks to the immense low-rev shove of its 2.8-litre twin-turbo V6. They've five totally different characters, which is no surprise when the best-seller, the car that arguably defines this class of driver's car, is an idiosyncratic, unfashionably rear-engined, near-30-year-old design. The 911 isn't the only car here that can trace its origins back a decade or two. The Ghibli is into double figures and Esprit has birthday cards from the Seventies. Facelifts have kept the Lotus fresh but the other mid-engined design, the NSX, makes it feel its age, especially from behind the wheel. Some have accused the Honda of being too easy to drive, but why gripe about comfortably weighted, slick controls and perfect ergonomics? Its electric power steering – standard on all NSXs – is feather-light when manoeuvring, which is perhaps taking ease of use a bit far, but assistance tails away to nothing at speed to leave a much weightier, manual system. Stretching the legs of the Lotus for the first time, you're certain you're working a lot harder than the driver of the NSX behind. Slung low in the Esprit's cockpit, you know you've got the power. 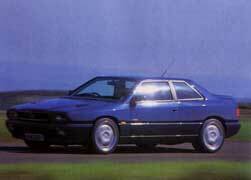 The hard, four-cylinder-like beat of the flat-plane V8 is matched by rock-solid acceleration, while the turbos of the 350bhp V8 wind up with a whistle like an InterCity 125 and dump boost on the overrun with a hollow chuckle. Yet it's difficult to get into a rhythm with this car. The new twin-plate clutch is very light but the gearshift is heavy and cumbersome, and the nose weaves nervously under braking for bumpy corners. 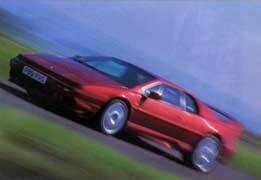 Behind, the NSX calmly reels in the Esprit, parrying the bumps so they hardly seem to exist as its driver casually wrist-flicks dow a couple of gears and sights up the apex. The low facia of the Honda gives a much deeper screen and its pillars are slimmer, too, all of which means less stressful but equally rapid progress, despite the steering needing firm, muscular inputs. 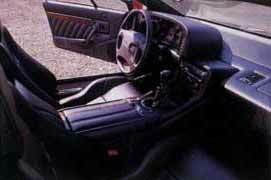 At this stage you won't have clicked with the Esprit, so while it feels like you could hold a conversation or listen to the radio in the NSX, in the Esprit all will be silent concentration. Mind you, the howl of the Honda's V6 makes its Bose sound system redundant. Power has risen only a couple of notches but the torque curve is fatter (up 11lb ft to 220lb ft) and at 6,000rpm when the cam timing changes, snicking the motor into hyperdrive, the curling bellow from behind is deeper and scarier than before. The stronger engine alone wouldn't make a huge impact, but with six ratios the V6 never drops from the centre of the VTEC zone on an exhilarating, headlong rush through the gears. Unusually, shifting into sixth flicks a switch; the extra ratio is engaged by a solenoid, not levers and forks. You'd never know. Bystanders don't get the benefit of the NSX's vocal performance. The Maserati's V6 sounds best at the tailpipes – a rich, resonant burble – but the Honda's tune is played through the induction system so it reverberates around the cabin rather than the hillside. Some complain that it's engineered-in character but with ever-stricter noise regulations, it may be the way forward. Certainly the Esprit wouldn't hurt for a bit of this technical trickery. There's an aftermarket 'track use' exhaust system available which apparently turns the bland V8 into a Cosworth DFV clone, but Lotus isn't considering anything like it for production cars. Pity. You'd think the TVR would have the same trouble; it too has a flat-plane crank V8 marrying the beats from each cylinder bank into a four-pot scream. Check out the engine shot and you'll see part of the reason this Cerbera sounds meatier, namely carbonfibre induction pipes that interweave like a basket of eels. It's the system from the Tuscan racers, and that's where this 4.5-litre AJP comes from. It won't be dry-sumped in the Cerbera, and with catalysts power is set at 400bhp (about 50bhp lower) but that's more than enough. The Cerbera weights a good 500lb less than its rivals, giving a power-to-weight ratio of 325bhp per ton – that's 100bhp per ton more than the Esprit. All this for £45,000, or £25k less than the NSX (not on sale, incidentally, until early next year), £20k less than the 911 and £15k less than the Esprit. The Ghibli will set you back a far more reasonable £45,995 for the 330bhhp 2.0-litre version, while this less powerful but torquier 284bhp 2.8 is one of only four made and cost about the same. 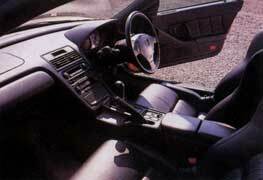 Both feature cockpits with carbonfibre instead of wood, split-rim alloys, a free-flowing exhaust and, like the Lotus, hunky Brembo brakes. Production versions of the Cerbera 4.5 – the only other car here with four useable seats, just – will ride on 17 in magnesium alloy rims but it's unlikely they'll have this prototype's flaming exhausts, which pop and bang on the overrun like a posse riding into town. Long, low the lithe, the Cerbera doesn't need fireworks to grab attention, or scoops and spoilers to register its intent. 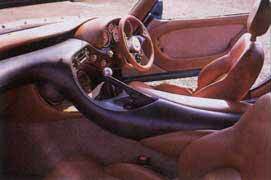 You'd imagine that nothing could live with the TVR on a quick road, especially as it boast suspension revisions, too. 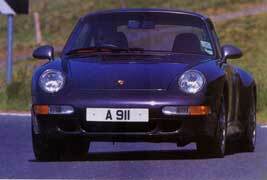 Yet deputy editor Meaden is having a hard time shaking off the 911. There are parallels here with the Esprit/NSX scenario. These roads are fast, demanding and difficult to read. They throw up shallow and tight corners randomly, some sighted and some not, so you're always on your toes. It's as if the Cerbera and 911 are connected by a huge bungee rope, the TVR roaring away whenever there's a straight, only for the Porsche to zoom back onto its bumper under braking. The Cerbera rides the undulations much better than pervious examples we've tried. It seems to have more travel and progression and so it deflected less, which mean less corrections with the super-sensitive, quick-rack steering – after a blast in the Cerbera, any other car's steering feels slow and woolly. Overall, it's a much less nervous, less knife-edge experience than before. You still want to slow everything down on the entry to corners. The front screen is like a pill-box slit, the monster AP Racing brakes don't have the safety net of anti-lock and it can still feel a little ragged and loose if the surface you're braking on is cambered and rippled. 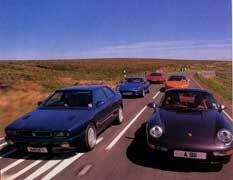 In the same situation, for all its foibles, the 911 feels remarkably composed and positive. Sure, at times there are some strange, tail weight-induced squirms over cambers the NSX barely acknowledges, but when you need it, the mass of that gruff flat-six works with you. You sit higher in the 911, so visibility is better, and while the Cerbera driver is thinking about what the wheels are doing, modulating his braking and effecting a clean downshift with that heavy change, the 911 driver is squeezing the last from the brakes and effortlessly double de-clutch downshifting, ready to peel into the turn and get on the power. The Cerbera fights for traction on the exit – its 'Hydratrak' limited slip differential initially allows both rear tyres to light up and then, just when you've got a twist of lock on, adjusts itself and lets the inside wheel spin. 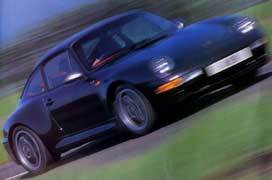 The 911 simply plants its tail and sling-shots after it. 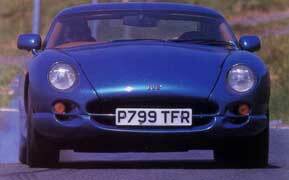 Meaden emerges from the TVR looking flushed but smiling and says: 'That was fantastic.' We're all agreed that the Cerbera has never been better than this: it's faster, more stable and, like the NSX, its bigger engine comes with a bigger, beefier sound. After each photo-call, the Maserati was last to find a driver for the blast, but everyone stepped out of it nodding sagely and muttering something like, 'You know, it's pretty darned good, that.' In isolation the Ghibli feels decently rather than outrageously quick. It doesn't lunge for the red-line like the NSX, it doesn't bark like the TVR, and its tail snaps out of line like it's on casters compared with the 911, but this simply disguises the real speed of this genuine four-seater. It's not an exotic design and it's as dynamically straightforward as its front-engine, rear-drive description suggests. Yet it'll keep any of the others here at bay, which confirms that it's doing plenty right. Part of its success is down to its fantastic in-gear acceleration times. The Ghibli might not be that competitive in a straight-line sprint, but when it comes to the corners where throttle response counts, that lusty, fruity-sounding V6 is right on the button, unlike the Esprit. Having six speeds (borrowed from the BMW M3) helps, and although the shift can be a bit sticky you soon appreciate that you don't have to use it that often to make good progress. As all five cars are near as dammit equally rapid on these roads, other factors come into play: character, entertainment, sound, looks, ambience, quality. As the test progressed, the Esprit staged an impressive comeback. It doesn't flatter your driving so it takes a while to get into the groove, but once you understand that it doesn't understeer or oversteer, just grips, you'll be slicing into turns at incredible speeds. And it's phenomenally quick in a straight line, too. It rocketed off the line to hit 60mph in a mere 4.4secs and on Millbrook's two-mile bowl it hit a peak of 172mph on its way to an average of 169mph. Stunning. It look fabulous, too; a purposeful wedge with curly, wood-shaving details, numerous ducts and vents and a fat-tyred, race-car stance. 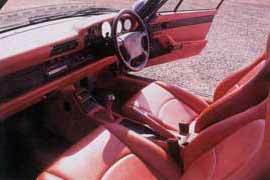 Sadly, there are just too many aspects that are so-so; the potent but charisma free V8, the unfashionably wide panel gaps and the leather-lined interior that chatters and vibrates over roundabout countdown lines like the space shuttle attempting re-entry. Don't get the wrong impression, though; the finishing order of this test is stacked as closely as the ratios of a racing gearbox. 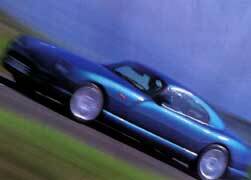 Unfortunately, we never got the chance to put figures to what is unequivocally the quickest car here, the Cerbera 4.5. The times that appear in the performance table are those of the regular 4.2-litre, 350bhp car, and even these trounce the opposition. With its better-sounding 4.5-litre AJP V8, the Cerbera 4.5 pushes TVR performance onto an even higher plane, to a level where only the world's fastest cars can compete. It has never handled better, either, with improved composure and a more compliant ride, both of which make the whole experience less frantic. The Maserati doesn't attract a tenth of the interest of the low-slung, brilliant blue TVR, but some would see that as an asset. The pace of the Ghibli is equally subtle, disguised by a richly tone engine that does its best work in the low- to mid-range of its rev counter's dial. It's all so effortless, so much power and torque so easily accessed and exploited, that you don't appreciate the progress you're making even when the over-stiff front-end starts to complain. Tight corners present an opportunity for fun; tuck the nose in, get on the gas early and you can ride out an easily-held slide that an England defender would be proud of. 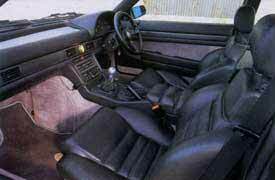 However, like the Esprit and Cerbera, it feels less than rock-solid on rough roads, and its interior isn't special despite the use of carbonfibre and copious amounts of stitched leather. You never feel completely at home in the Ghibli, with its old-style Italian driving position and oddly shaped seats which lack shoulder support, but it's by far the most relaxed cruiser, as befits its full four-seater design, so it's arguably the most usable car day-to-day. 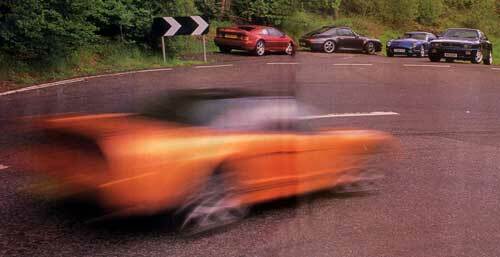 That said, if its impact you're after, the TVR beats it. 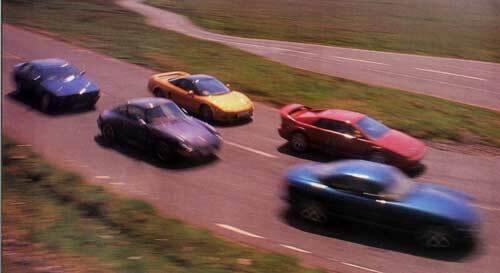 It's a straight fight for first, though: NSX versus 911. In truth, the 911 S isn't the 911 we'd have chosen. You don't have to have the silvery styling details but that's not the real complaint. The S takes the regular 911's wheels and tyres and, with the aid of rear wheel spacers, fits them under the wider Turbo body. This robs the 911 of some of its delicacy and apparently some performance, too; we couldn't better 5.3secs to 60 and 157mph – half a second and 2mph down on the standard Carrera. The 911 is an intimate car, though, constantly reacting to the road surface and tugging at the large wheel in your hands. It takes a few miles to get over the initial awkwardness, but once you have you'll find a car with soul. Compared with the NSX's clever and efficient V6, the 911's flat-six is almost organic; a living, breathing, wheezing, throbbing heart. You don't need a rev counter because you can hear and feel when it's time to shift up, and there always seems to be a little more urge when you crack open the throttle. 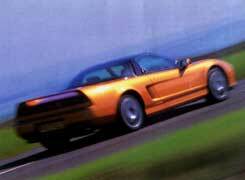 You never feel you're making the most of the NSX unless it's in the VTEC zone, wailing its approval. 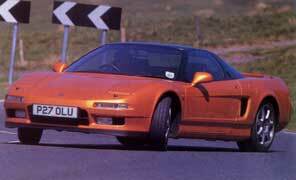 However, there's no denying that the six-speed, 3.2-litre NSX is right on the pace. The bellow from its VTEC V6 is more stirring than ever, the extra ratio makes its delivery even crisper, and its ability to skim over bumps and hollows remains a revelation. 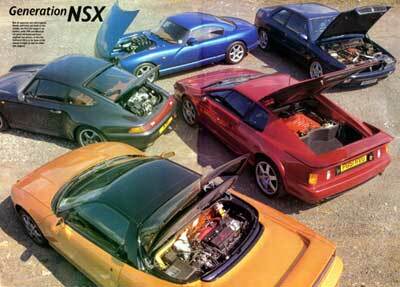 While the 911 relays every contour, the NSX filters out what is merely detracting and feeds back only what is important to the driver. Trouble is, its steering isn't to the same standard. Slightly low gearing we can live with, but combine it with hefty weighting at speed and the NSX becomes reluctant to change tack quickly, just when you need it to. The 911 is at its best when pushed to its limits: the way its controls work and the clarity of feedback from its chassis tell you that dedicated engineers have been there before you, refining and polishing. It's immensely satisfying. Yet just taking the 911 to the corner shop engages your senses and tells you you're driving something special. That's why it sells so well. That's why it wins.